I’ve had this book sitting on my Kindle for a while now but finally got around to reading it. 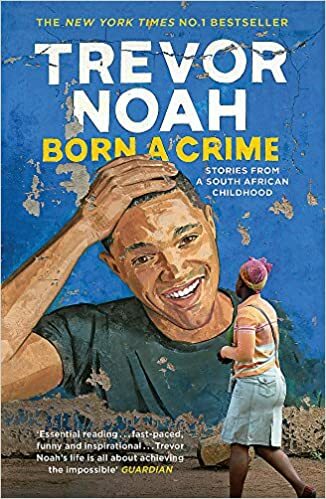 Trevor Noah is a great storyteller and the book is organised into chapters around events that have the same theme or are just based on a specific event. Each chapter/vignette is prefaced by a factual couple of pages explaining the context for what is about to follow. For example there is a long story occurring when Trevor is in his late teens that is centered around him becoming a DJ for street parties and the dance group they formed to perform, where the name of the best dancer in the group is Hitler. The preface to this chapter is about the education system under apartheid which taught only certain things and particularly if you were a black South African, taught you almost nothing and certainly nothing about world politics including World War II and the atrocities committed by another man named Hitler. In this particular instance, the set up is needed for context of what happens but in other cases the educational sections are more general but no less horrifying for discovering just how brutal the apartheid regime was. A couple of things I didn’t like and this is more personal preference rather than the writing style or content, which is engaging and amusing. The book is not arranged chronologically, in some chapters, Trevor will note his age but in others he does not. A few times later in the book I was left thinking “wait, what? How old was he here?”. One such story towards the very end of the book centers on Trevor and his family having to move out of their home and sleep in the stepfather’s garage business. Trevor spent a year sleeping in the back of cars because he did not have a bed. He alludes to falling grades at his primary school which gives a clue about his age but it was rather jarring to have a story centered in the early part of his childhood so late in the book, especially when no other references to it had been made earlier. The last story in the book again is written with no age clues but he briefly mentions being able to pay a hospital bill from his earnings from his stand up and TV work. But there was no other discussion in the book as to how he moved from being a DJ at street parties to TV/stand up work. I’m really hoping there is a sequel that covers that section of his life because I’d really like to know how he got noticed. Trevor Noah is a really engaging storyteller and I’d recommend the biography to anyone who wants to know more about the man or more about growing up under a regime like apartheid. Share the post "A Horrifying Look at Apartheid from the Inside"
Good timing- I just borrowed this one from a friend so its nice to get a heads up on what to expect. Thanks! Wow. I never would have been interested in this book if you hadn’t mentioned the apartheid connection. I’d like to check it out now. The audiobook of this is also absolutely fantastic. His voice, and his impersonations of his mother and grandmother, really pulled me further into his story. I second the audiobook recommendation. He narrates, and his various accents are super interesting. Plus it, it just necessarily makes the entire this more real, and present.